The Indian beer industry is booming, with annual growth of 10% expected in forthcoming years, and a visit to India wouldn't be complete without trying some of the top Indian beers on offer. Beer was introduced into India by the British, who eventually set up a brewery that produced Asia's first beer -- a pale ale called Lion. However, these days, lager is the predominant type of beer available in India. It comes in two strengths -- mild (around 5% alcohol) and a generous strong (6-8% alcohol). Depending on the place, a large 650 ml bottle of beer will cost you about 100 rupees at a liquor store, and double or triple that at a bar in India. While international beer brands such as Fosters, Tuborg, Carlsberg, Heineken and Budweiser are available and rapidly growing in popularity in India, this article focuses only on Indian beer brands. The largest producer of beer in India is Bangalore-based United Breweries, which makes Kingfisher and Kalyani Black Label. The company dominates about half the market. Global brewing giant SABMiller (now Anheuser-Busch InBev) entered the Indian market in 2000. In 2001, it acquired Mysore Breweries (which makes Knock Out beer), followed by Shaw Wallace’s beer brands Royal Challenge and Haywards 5000 in 2003. It's the second largest beer producer in India, with a market share of around 25%. What's particularly noteworthy is the recent rise of craft beer in India. It's expected to be a major trend in the future with many new players entering the market. If you're interested in Indian craft beers, check out these microbreweries in Mumbai. Kingfisher, "The King of Good Times", is India's most recognized and widely available beer. Its name has been associated with sports, fashion, and even an airline. The brand was launched in India in 1978 and has a huge market share of about 40%, although this has decreased by 4.3% in recent years according to market research. The beer itself is a light tasting, easy-drinking lager with plenty of malt. It goes down really well -- if not a little too well at times! 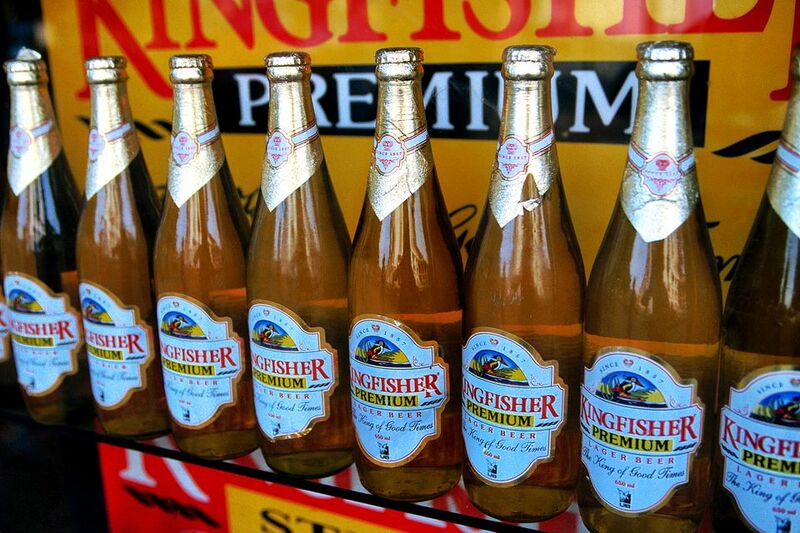 The very popular Kingfisher Strong, containing around 8% alcohol, leads the Indian beer market. It has more flavor than the regular Kingfisher Premium, which has 4.8% alcohol. Another variation is Kingfisher Blue, marketed at the young and trendy. This is also a strong beer with around 8% alcohol but it has a very light watery taste. Distinctive and full-bodied Kingfisher Ultra, made from imported ingredients, is the newest label to hit the market. The Haywards beer brand is most well known for its iconic Haywards 5000 strong lager, which contains 7% alcohol. The brand was launched in 1974, with the Haywards 2000 mild beer, as an extension of the renowned Haywards liquor brand (which was founded in the early 1900s). Haywards 5000 subsequently hit the market in 1978. Recently, in 2015, SABMiller launched a Haywards 5000 BOLD beer that's brewed for 48 hours longer and has a full-bodied taste. Haywards also produces a rarer super strong Haywards 10000. Haywards has a market share of nearly 11%, and is consumed the most in Rajasthan, Punjab, Haryana, Madhya Pradesh, and Chattisgarh. The Haywards brand of liquor was founded by Britisher Sir Anthony Hayward, and two of his grandchildren run a fantastic heritage bed and breakfast in south Goa. The bar serves Haywards 5000, of course. And there's free beer for anyone who can beat the drinking record. Godfather is the flagship beer brand of Devans Modern Breweries Limited, a brewing company that commenced operations in Jammu in 1961. The beer comes in three varieties -- Strong (7.5% alcohol content), Lager (5% alcohol content) and Lite (4.5% alcohol content). What's unique about Godfather beer is its long brewing cycle, which lasts for 25 days, as opposed to the usual 12-15 days. This gives it body and a fresher taste. You'll find that Godfather Lager and Lite beers are more bitter than other lagers such as Kingfisher Premium. Godfather has become the fastest growing beer brand in India in recent years due to a wide range of brand promotions, and is particularly popular with the youth. It's mainly consumed in northern India, where it has market shares of between 20-50%, depending on the state. Launched in 1984, Knock Out beer is particularly popular in the states of Karnataka, Telangana and Maharashtra. The brand's purpose is to "celebrate strong men who display a strong character". This malt beer does pack a punch! It has has a powerful taste and aroma, alcohol content of 8%, and good carbonation. The brand has about a 9% market share and many loyal drinkers in south India. Kalyani Black Label is one of India's oldest lagers (and some will tell you that it's an old man's drink). It has iconic status in West Bengal, where it was launched in 1969. The beer is named after one of United Breweries' first breweries, in the West Bengal town of Kalyani near Kolkata. It's popular across eastern India as well as Delhi, and comes in both premium (mild) and strong varieties. The strong beer is described as "a smooth, mellowed brew with an extra bite". Its alcohol content is a generous 7.8% and it has a surprisingly sweet aftertaste. If you like a beer with plenty of flavor, go for Kalyani. Royal Challenge Premium Lager was launched in 1993 and has an alcohol content of about 5%. The beer's extended brewing cycle makes it smooth with a rich taste. Advertising focuses on the brand's smoothness with the line, "Wish your life was as smooth as Royal Challenge". It's not as flavorsome as Kalyani Black Label, but is still distinctive. SABMiller launched a strong version of the beer in south India in 2011. The beautiful beaches of Goa and Kings beer go hand in hand. This beer, which unfortunately is only brewed and sold in the state of Goa, is a highlight of any trip there. The Kings Black Label premium pilsner is a very light tasting, pale colored, beer that's known for its smoky malt aroma. Its got an alcohol content of 4.85%, and is priced very attractively. A small 375 ml bottle will only set you back around 50 rupees at most beach shacks, and half that at a liquor store. No wonder Kings remains a fond memory for many people long after the vacation is over! Nowadays, Mumbai's inhabitants can recreate the vacation at home. Kings beer was launched in the city in 2015. Move over mainstream beers, Bira 91 (the number stands for India’s country code) is a new craft beer that's taking urban India by storm. Introduced in 2015, it's already become a household name among beer lovers and is the highest selling premium beer in many capital city bars. The company aims to fill the gap in the market for a "trendy, unorthodox, fun and smart brand of beer". It's positioned between the mainstream Indian beer brands and expensive imported ones. In order to identify and create beers that would suit the Indian palate, the company's founder spent three months traveling across Europe. Bira 91 started out with two varieties that are much milder (with alcohol content below 5%) than other beers in the Indian market. Bira 91 White Ale is a low-bitterness wheat beer with a hint of spicy citrus, while Bira 91 Blonde is a flavorful lager with extra hops and malt. The company has subsequently introduced strong and light beers. Bira 91 Light is a low calorie beer with reduced alcohol content (4%) for health-conscious consumers. Bira 91 Strong is a high intensity wheat beer with an alcohol content of 7%. In testament to Bira's desirability, the company launched without a marketing campaign and has relied on word of mouth. In May 2017, Bira 91 was featured in the United Nations’ Beer of the Month Program.